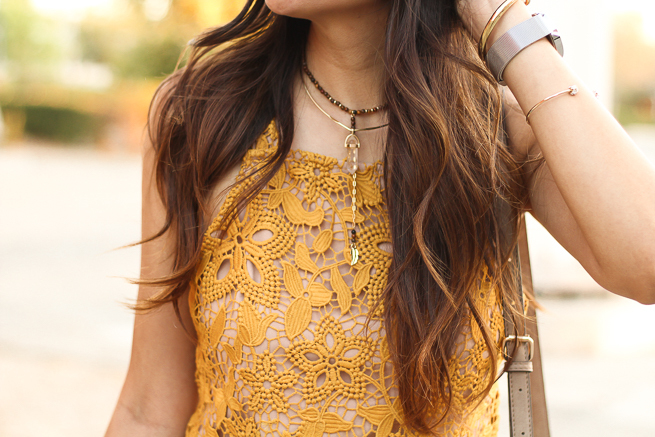 Today I wanted to share this cute mustard lace dress. The details on this mustard yellow dress are my favorite. The zig zag hem and the low back are just to die for! I also love that it can be dressed down, with a denim jacket to be a little more edgy- since it is paired with lace that is traditionally more girly than edgy. Also, this dress just marked down and is under $60 ! Anyhow, I am really crushing on this warmer color palette; pale yellows, rustic oranges, and burnt reds. It so much resembles the changing colors of the leaves that is not as common to find in SoCal yet- but a girl can try to get the Fall vibes with this color scheme. I have slowly been able to add some layers to my outfits in the evening- but for the most part it is still so warm! I just envy those that live in gorgeous landscapes where leaves fill the floor and the sky is adorned with changing colors of the tress. I've lived in SoCal most of my life and I always try to make a trip around this time of year to a more "Fall vibe" kind of place. I think this year I'm going to try to squeeze something in with my sister and go up to the mountains near by or something, OR at least try and find a pumpkin patch. Yes, I'll settle for a pumpkin patch with pumpkins on the floor. Soon it will be Christmas and I don't want the holiday seasons to pass me up. Do ya'll have any recommendations for places in SoCal to visit during the Fall? I'll be looking for some pumpkin patches this weekend and I'll ya'll know how it goes.